Paper 3" x 5 3/4"
Side 1 printed with four-color process. Side 2 printed with 1 PMS color using light coverage. 80lb White Smooth stock uncoated. K1 notched key slits on both pockets. 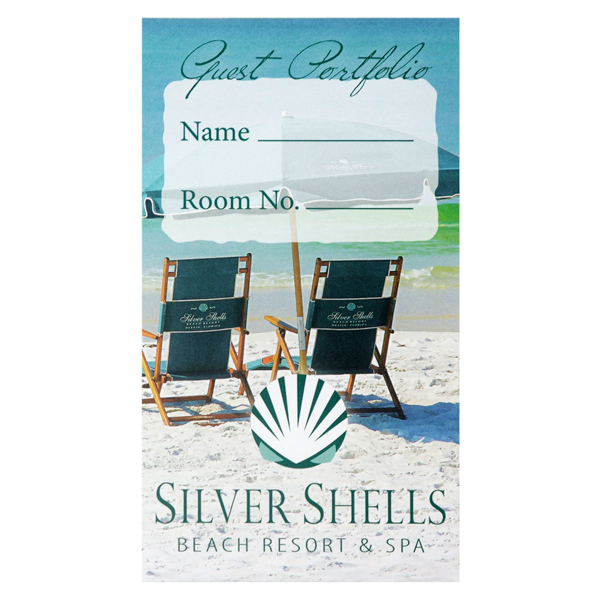 Silver Shells' scenic cover design welcomes visitors to Destin, Florida. The photo showcases one of the pristine white sand beaches visible from the resort's suites, which feature fully equipped kitchens and laundry machines. The interior includes a list of amenities, check-out times, and contact information. The logo for Visionary Destin, Silver Shells' parent company, appears at right, while the back panel lists their combined services. Side 1 printed with four-color process. Side 2 printed with 1 PMS color using light coverage. 80lb White Smooth stock uncoated. K1 key card slits on both pockets. Guests' names and room numbers are written in a white box on the cover, making them easy to read. Behind it, a photo showcases The Palms' pristine swimming pool and tropical landscaping. Both inner panels inform guests about amenities and services. The Palms' address is on the left pocket, with parent brand Visionary Destin's logo at right. Guests can learn more about the resort on the back cover. Side 1 printed with four-color process. Side 2 printed with 1 PMS color. 12pt C1S Semi-Gloss stock coated with Aqueous Gloss. Custom slits on both pockets. A gentle tide rolls toward the word "Welcome!" 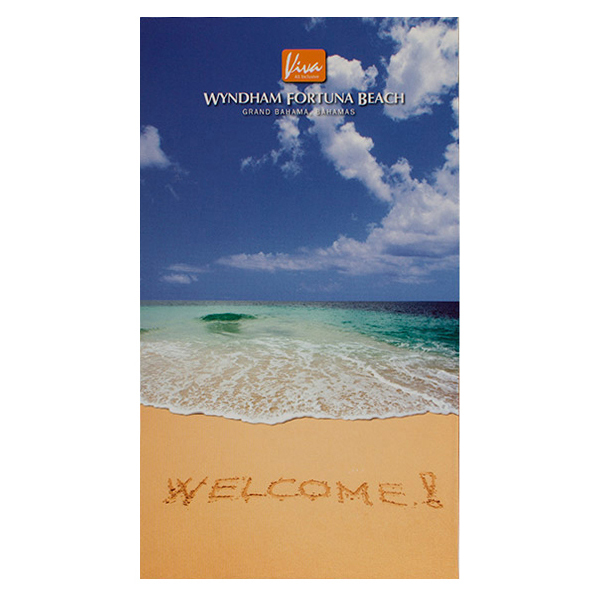 etched into the sand at Grand Bahama Island, greeting visitors at the Viva Wyndham Fortuna Beach resort. The photo gives guests a glimpse of the gorgeous scenery they can expect to enjoy during their stay. Interior panels colored the brilliant orange of a tropical sunset handle more practical matters, including check-out times, extension numbers, and room numbers. Labeled pockets help guests tell their room keys and towel access keys apart. On the back panel, a map guides visitors around the 26-acre property and its luxury amenities. Side 1 printed with 1 PMS color. 80lb White Smooth stock uncoated. K1 notched key slits on both pockets. 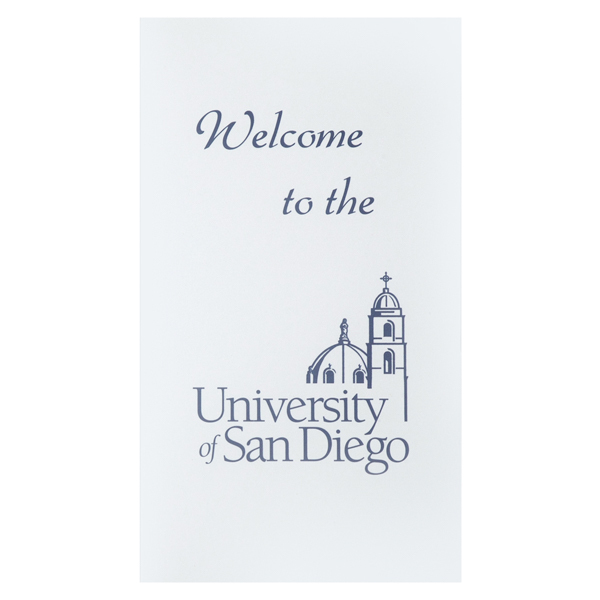 The University of San Diego welcomes guests with thin blue lettering in the school's color, while a slightly round script font adds a personalized touch to the greeting. The logo depicting campus architecture is the only image on the minimal design. Two interior pockets hold gift cards, meal tickets, or other small items. 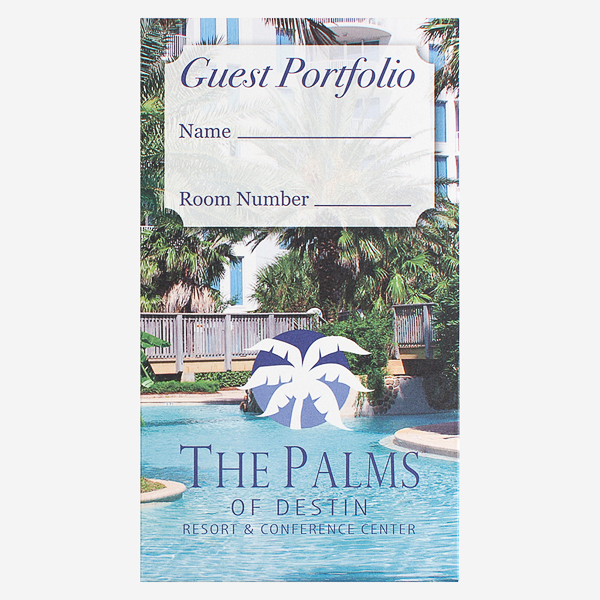 At 3 3/8" x 6", this compact design's two interior pockets let you present multiple hotel key cards, gift cards, or other small media up to 3" x 5 3/4" in size. Optional free card slits are available to provide even more storage space. Adding slits to one or both pockets lets you carry up to four cards or place small media bearing important hotel or gift details inside the pockets. The pockets also provide an imprint area for relevant information, such as the amount of money on a gift card or a hotel room number. Top off the design with your brand's mission, logo, or a custom image on the portrait-oriented outer panels. Dimension Closed: 3 3/8" x 6"
Acceptable Insert Sizes: 3" x 5 3/4"